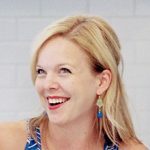 When my love of cooking, baking, and all things food comes up in conversation, people often ask what sort of recipes I like the most. Sweet or savory? Cooking or baking? Quick and easy or involved and time consuming? I struggle to come up with an answer because my interests aren’t easily defined. I love it all! There are nights when I’m dead tired and quick easy recipes are the only viable option, but I also love some good project cooking and baking when my schedule allows. 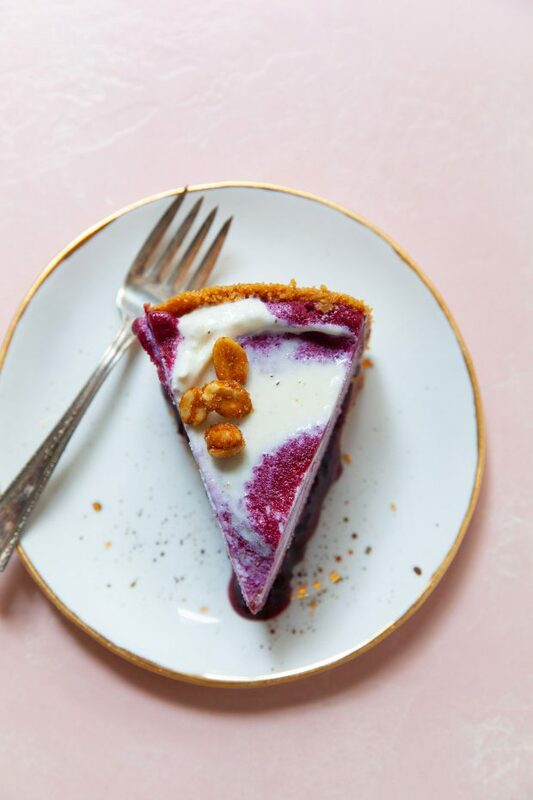 The beauty of this peanut butter and jelly ice cream pie is that it can be either a relatively simple endeavor or an epic confection with every component made from scratch. You get to choose! When Tartine Manufactory opened a couple of years ago, I saw videos of their frozen peanut butter and jelly pie and was supremely disappointed that they hadn’t opened a couple of months earlier when I was in town. 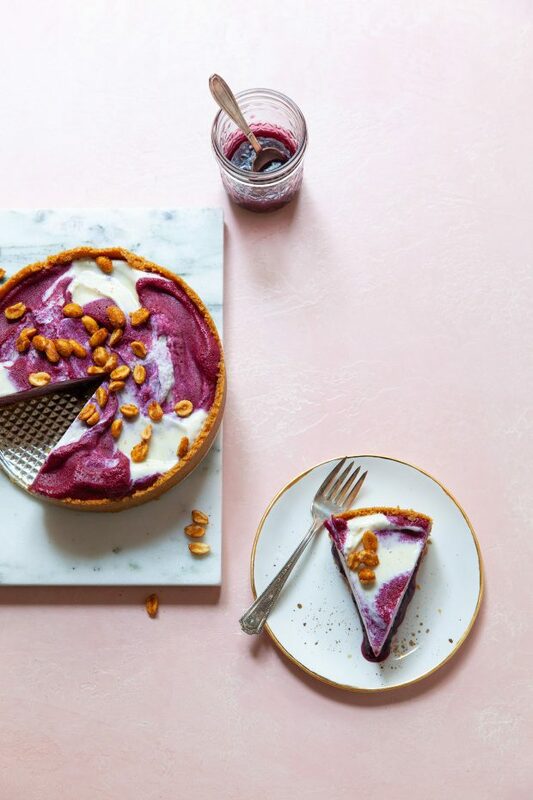 This stunningly beautiful pie consists of a peanut butter cookie crumb crust, a layer of jelly, sorbet swirled with vanilla ice cream, and honey roasted peanuts on top. A few weeks ago when Concord grapes came into season, I figured it was time to create my own version of that dreamy dessert from the videos and got straight to work. I burned the first batch of jam, but I persisted. I acquired more grapes. Made more jam. Acquired still more grapes, and made sorbet. Baked cookies for the sole purpose of crushing them to become the cookie crumb crust of this pie. I had planned to make the vanilla ice cream myself but found three unopened pints of Jeni’s in the freezer and figured I didn’t need to go quite that far. It was a huge relief to finally slice into the pie, take a bite, and feel that all of my efforts were worthwhile. Line the bottom of an 8-inch springform pan with a round of parchment paper. In a medium bowl, combine the peanut butter cookie crumbs with the melted butter and the salt. Mix with a fork until the mixture clumps together but is not greasy. Add slightly less than half of the crumbs to the pan and press in an even layer to cover the bottom of the pan. Use the remaining crumbs to press against the sides of the pan, coming up at least 2 inches in height. (I use a straight sided drinking glass to evenly and firmly press the crumbs against the pan.) Transfer to the freezer to set for 15-20 minutes. Add the jelly to the bottom of the chilled crust in an even layer. (I used a pastry bag with the tip cut off to pipe the jelly into the crust, both for ease of dispensing and so as not to dislodge crumbs from the bottom of the crust with a spreading motion.) Transfer to the freezer and chill for about 20 minutes. 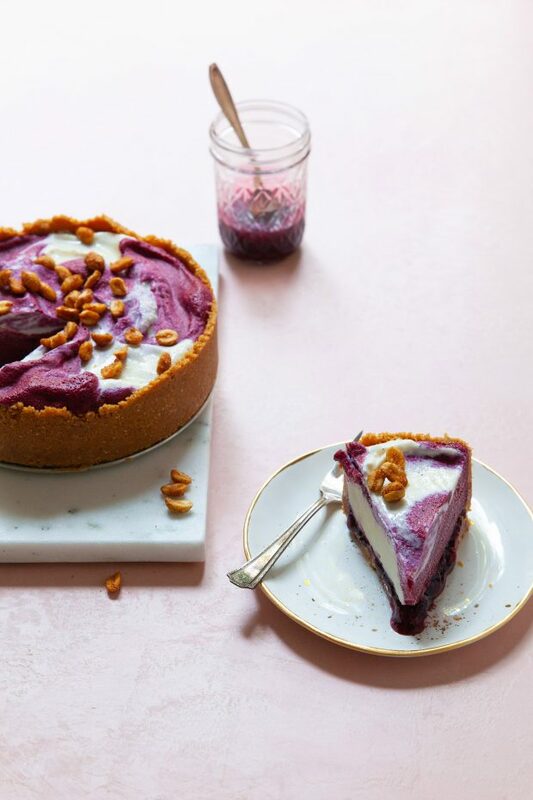 Use a large scoop to add three scoops of the ice cream to to crust shell, equidistant from each other. Add in three scoops of sorbet, so that they are alternating with the ice cream scoops. Use the scoop for the ice cream again, and this time place a scoop of vanilla ice cream on top of each scoop of sorbet in the bottom layer. Scoop and distribute more sorbet so that each scoop is on top of a scoop of ice cream in the bottom layer. 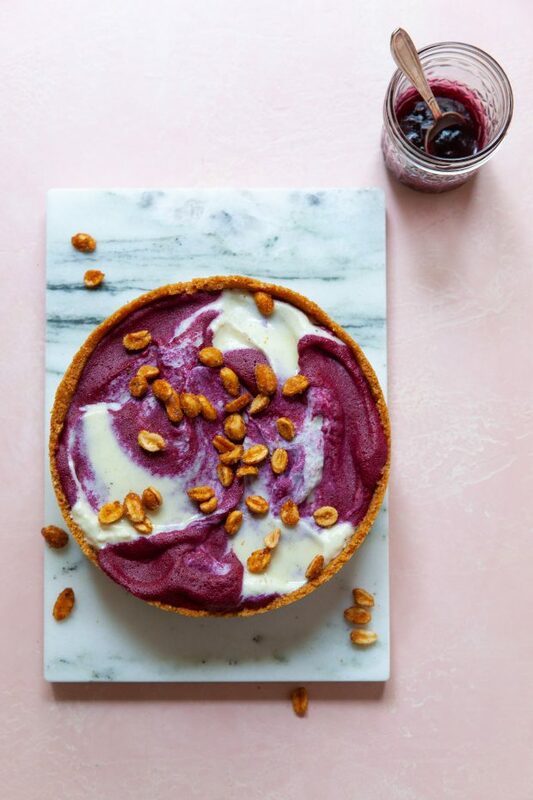 Use an offset spatula to gently and minimally swirl the sorbet and ice cream together while spreading them to the edges of the crust. Transfer to the freezer to fully set, at least 1 hour. When you are ready to serve, carefully unfold the pie from the edges of the springform. Garnish with the honey roasted peanuts, slice, and serve immediately. I used the recipe for honey roasted peanut butter cookies from the BraveTart cookbook to make my cookies. If you choose to make the sorbet yourself, I recommend getting the ice cream out of the freezer to soften right when you add the sorbet to the ice cream maker. They will both reach the optimal texture for filling this pie at approximately the same time. Err on the side of less spreading and smoothing when adding the ice cream and sorbet the crust. While it is tempting to keep working the filling, the more you agitate it, the less dramatic and artful your swirl effect will be.